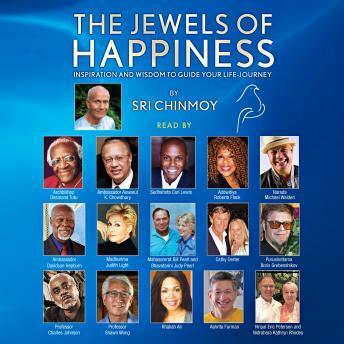 "The Jewels of Happiness" contains poems and prose by renowned Indian spiritual guru, Sri Chinmoy. Ever since he led the Peace Meditations at the UN, the power of Sri Chinmoy's initiatives have been praised by world leaders and influenced thousands of individuals. Nobel Peace Laureate Archbishop Desmond Tutu stated, "These sweet gems of wisdom by my dear friend Sri Chinmoy are timeless truths full of encouragement, love and goodness." The audiobook was released March 19th at the United Nations headquarters in New York on the eve of the first "UN International Day of Happiness" and contains chapters read by Archbishop Desmond Tutu, singer Roberta Flack, Olympic champion Carl Lewis, musician Michael Walden, actress Judith Light, musician Boris Grebenshikov and many other spiritual, diplomatic, artistic and athletic luminaries.